Welcome to the Eustachian Tube Institute web site which I hope you will find of interest. 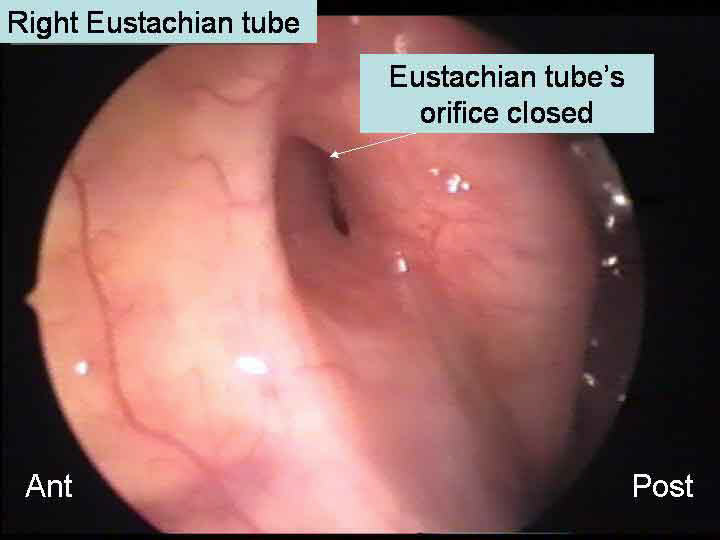 Eustachian Tube Surgery and general ENT information is presented here in several languages. Normal hearing requires a correct functioning of the tree ear’s segments divided in outer, middle and inner ear. To obtain the perception of any sound in our brain, the acoustic wawe has to be transmitted from the outer ear to the inner ear through the middle ear. 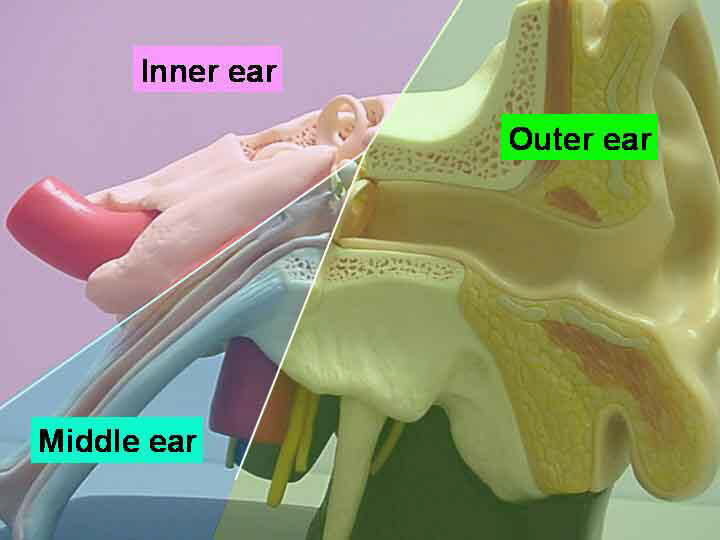 The middle ear works as an amplifying and transmission system. It transforms the acoustic wawe to a liquid wawe that can be decoded by the inner ear. How is it possible to reach and see an Eustachian tube ? will easily show you her right Eustachian tube. It’s not a simple tube. How it works. 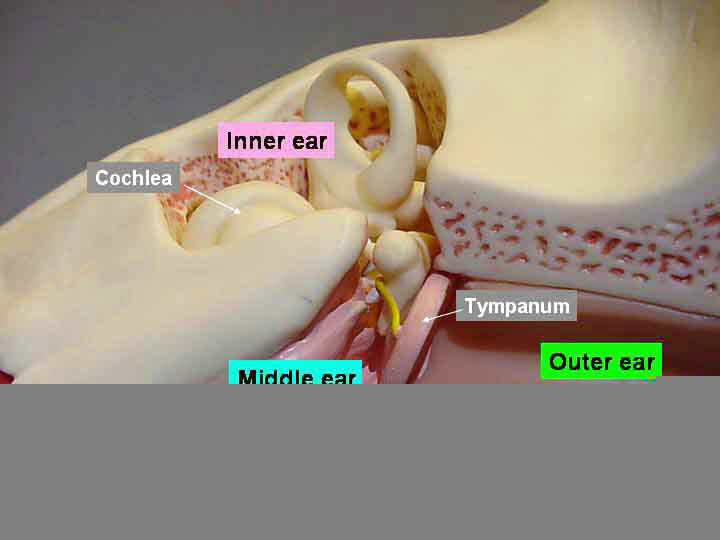 The tympanic membrane (eardrum) separates the middle ear from the external ear (external auditory canal). In the normal state, the eardrum is tightened in a slightly retracted position forming a cone with its summit pointing into the middle ear. If the pressure in the external ear increases or similary, if the pressure in the middle ear declines, the eardrum is pilled further inward. This is known as a retracted eardrum. On the contrary, the eardrum bulges when the pressure in the external ear decreases. The middle ear mucosa insures permanent gas exchanges with a tendency towards gas loss from the middle ear cavity into the blood. These gas exchanges normally lead to a constant decline in the pressure in the middle ear cavity. The main function of the Eustachian tube is to restore balance in this pressure. Two tubal muscles, the Levator Veli Palatini Muscle (LVPM) and the Tensor Veli Palatini muscle (TVPM) which is the main tubal dilator, ensure Eustachian tube function. The TVPM constitutes the anterior-external wall of the Eustachian tube and continues into the mouth between the connections of the hard palate to the soft palate. 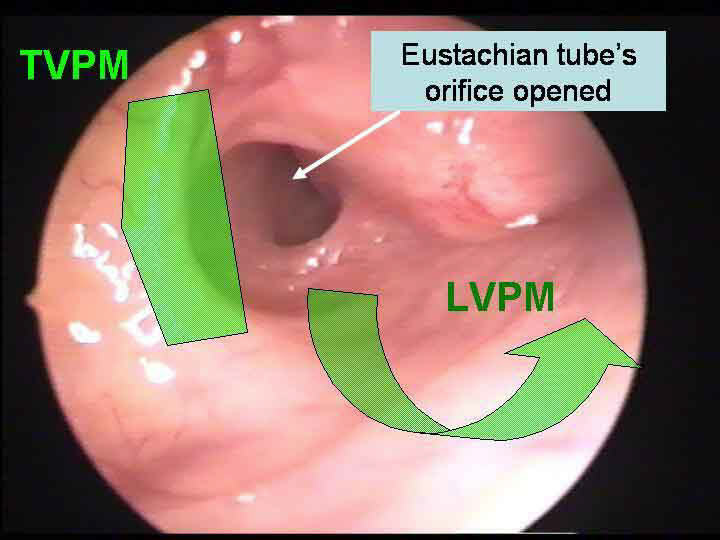 The LVPM constitutes the floor of the Eustachian tube and leads to the rotation of the tubal cartilage and the proximal opening of the tube. The acts of swallowing or yawning are usually enough to momentarily open the Eustachian tube, allowing it to regulate air pressure. However, it is possible that these actions are no longer sufficient, either because the Eustachian tube is blocked, or because it cannot respond to a greater demand from the middle ear when gas exchanges become more marked, such as during the average ear inflammation. This is known as “Eustachian Tube Dysfunction”. It can also happen that pressure in the external ear increases so rapidly that the tube cannot effect the necessary regulations fast enough, such as in free diving. Tympanometry, allows precise evaluation of eardrum mobility and assessment of middle ear pressure and surrounding air pressure. It can also reveal Eustachian tube dysfunction and can suggest the presence of middle ear effusion. Tubomanometry allows us to quantify with precision the degree and the type of tubal dysfunction. We can then establish a precise diagnosis and decide upon the adequate treatment and follow up. We use two lines. The yellow line represents the closure of the palate during the test. A fast ascent among C1 and C2 corresponds to good muscular dynamics of the velum. A stable level among C2 and C3 corresponds to good muscular tonus of the velum and allows to rule out Patulous Eustachian Tube or other malformations of this region. 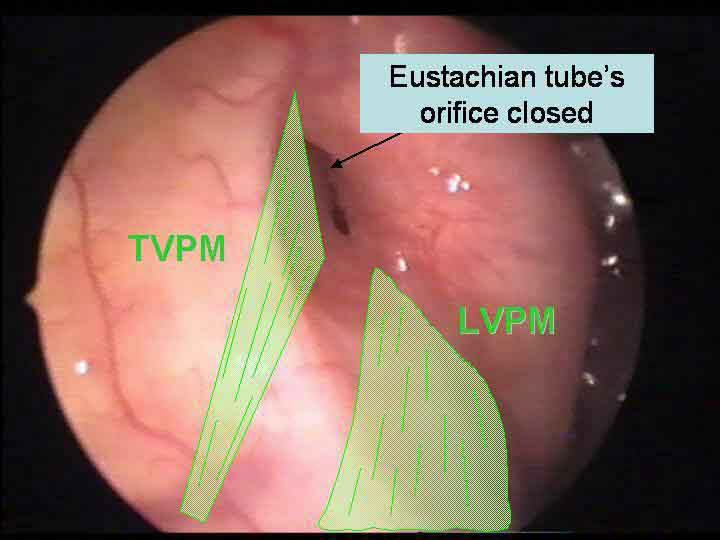 The red line represents the appropriate opening of the Eustachian tube. The gradient between P1 and P2 reflects the speed of this opening and the pressures equalizing in the middle ear. Here we have an exam within the standard limits. * Please write to us in English or French only - thank you. Veuillez nous écrire exclusivement en Anglais ou en Français - merci.